My husband and I took a leap of faith in March this year as we embarked on a three month house swap with a couple from Foster in NSW, Australia that came about through an enquiry via the Cornwall Bridge Association which my husband picked up. After a lot of deliberation and soul searching, quite a bit of research into the area and an exchange of emails, we decided to take the plunge. Not being too precious about “stuff” in the house, and the prospect of a stopover of three days each way in Singapore (where we had both lived in our youth) we booked our flights and made the house ready for our visitors. This involved the complete dismantling of my sewing room as the Australians had asked if they could bring their sisters with them too, so we then had to prepare for four instead of two visitors! We set off on 12th March full of excitement (with me dreading the long flight) but this wasn’t nearly as daunting as I had expected. We arrived in Singapore and were not surprised to find that we did not recognise anything at all in the city centre! However, we ventured further afield and found little pockets of recognisable Singapore of the 1960s and were able to reminisce a bit. We paid a visit to the Kampong Glam/Little India area and I was in seventh heaven – the textile shops were amazing – so much to buy but I restrained myself (extremely difficult!) until our return on the way back to UK – who knew what treasures I would find in Australia after all!! Finally we arrived in Sydney and took a five hour picturesque train journey north to a town called Taree, where we were met by some friends of our house swappers. They took us to our new temporary home in Forster/ Tuncurry (about a 40 minute car ride) and saw us safely inside. By this time it was early evening, and raining, so after a quick look around we found the car in the garage and set off to buy some food. Although groceries were quite a bit more expensive than in the UK, the variety was the same with plenty of choice. Forster is a modern holiday town, very popular and busy with families and young people in the holidays but it also has a very high percentage of retirees. The immediate area is very beautiful, surrounded as it is by lakes, waterways, rivers and glorious miles and miles of uninhabited beaches – all with very “squeaky” sand! We spent many days exploring the immediate vicinity of Forster and on reflection, the one thing that struck us most was the vast distances between places. We had decided not to make any concrete plans in advance, with the exception of a trip to Melbourne in April (for me to go to the annual Australian Quilt Convention (which was quite a “carrot”(!) and my husband to have a tour of the Melbourne Cricket Club). The Melbourne Quilt Convention was staged in the Royal Exhibition Centre – a beautiful Victorian building. Full of anticipation I made an early start and was there when the doors opened on day 1! Once inside, I decided to go and view the quilts and textile work straight away before the crowds got too big. The talent and creativity on display was wonderful – the colours and designs were so inspiring. The one thing that struck me was that most of the quilting was done on a machine. I mentioned this to a couple of people and the answer was that it is too hot in Australia to sit with a quilt on your lap! There were quite a number of traders and most of the fabrics, patterns and notions for sale were very much the same as we can buy over here. It was striking though that over in Australia most quilters favour brighter and more modern fabric designs, which is probably due to the much brighter light over there. The size of the show was roughly comparable to the September show at Westpoint but I had expected it to be larger. I did however, get to speak to Anni Downs at her stall – one of my favourite pattern designers. 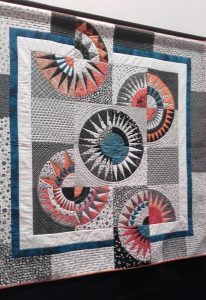 Prior to leaving UK I had made contact, through the Australian Patchwork Guild, with the local patchwork group – Seaside Heritage Quilters – and was invited to join them when I was able. Unfortunately I was only able to make it for one sewing day (due to other trips away) but was made very welcome. I had taken a piece of Cornish tartan as a gift, which was well received, especially as there were a couple of ladies there who had Cornish ancestry, one of whom had a daughter living in St Mawes, so we had quite a lot in common. 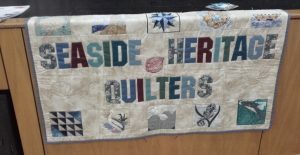 I was invited to the annual regional meeting of the 16 “local” groups which it was the turn of Seaside Heritage Quilters to host. The event was held in the local bowling club which had all the facilities of a conference centre. I was very surprised when I arrived to find it so well organised – each delegate had a table place allocated, a table favour, a special button, a free raffle ticket and a programme of the day. We were greeted with free flowing tea and coffee and what the Australians call a “Devonshire tea” i.e. scones, jam and cream. Whilst this was being enjoyed there was the opportunity for some retail therapy from the three local traders. We then settled down to listen to the two speakers. As it was a charity event, the first speaker was from an organisation called “Angel Gowns” under the umbrella of the Ronald MacDonald foundation. She gave a very moving account of their aim which was to produce garments for stillborn and premature babies to be buried in. They sourced their materials from donated wedding dresses which were carefully deconstructed and when remade would represent all the significant special events lost in the child’s life. 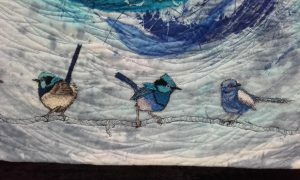 The second speaker was a textile artist, Jan Clark, who explained that she took her inspiration from nature within her own immediate environment. 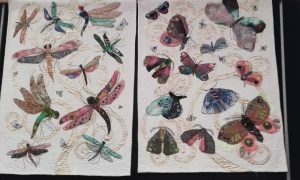 She works in layering, printing and rough quilting, and also executes meticulous drawings of moths and insects. Jan also showed us a work still in progress of a magnificent altar cloth for which she had been commissioned by the cathedral in Newcastle, NSW. We then enjoyed a delicious roast beef dinner plus a dessert. As with all things “quilty” there was a show and tell in the afternoon, and my goodness the work that was produced was, once again, wonderful. 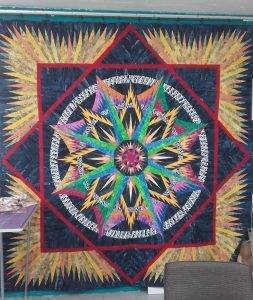 So much diversity and creativity – especially noteworthy were the foundation pieced quilts based on the Quiltworx (American) designs (worth looking up on the internet if foundation piecing is your thing). It was a thoroughly enjoyable day and I was so pleased to have been invited. Naturally, I did manage to “come across” quite a few fabric shops on our travels! My intention was to only be tempted by fabrics not easily available in the UK and so my focus was on anything with an Aboriginal design. I did manage to gather quite a nice stash of these fabrics which had to be packed into my backpack for the return journey as they weighed quite a lot! There was a lovely patchwork shop in the local town and I made quite a few visits and consequently struck up a really good relationship with Gai, the owner. 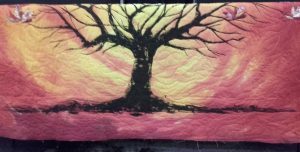 She told me that she would be exhibiting at the NEC Festival of Quilts this year – her speciality is felt applique/embroidery and her workshops were already fully booked. 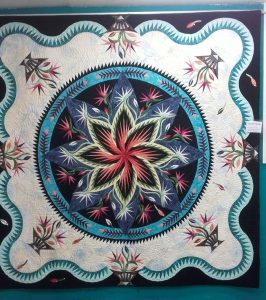 If you visited the NEC maybe you came across her – Just Patchwork of Tuncurry. It was lovely to be able to talk patterns/fabrics at will and it was the same in every shop I visited – people were just so friendly and helpful. Sadly, by the middle of May it was time to think about returning home – the days were really short by this time, getting dark by 5 p.m. We took the train back to Sydney and spent a day there around the harbour and Opera House and it was exactly as you would imagine from photos and film. Once again we found ourselves back in Singapore and re-visited the magnificent Orchid Garden in the Botanical Gardens and paid the promised return visit to Kampong Glam/Little India, where I have to confess to a little more fabric indulgence! It was good to eventually return home after such an extended visit but we have so many memories of beautiful scenery, hospitable and welcoming people. We learnt so much, especially about the indigenous people and history of such a young country, plus all the wildlife and plants. A wonderful and positive way to experience a different culture.